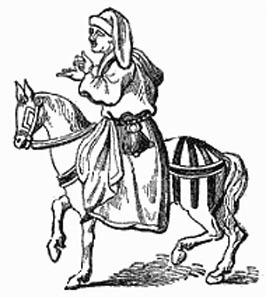 John Ball was an English priest and one of the leaders of the Peasants Revolt of 1381. The revolt started in Essex at Brentwood. It was only when the revolt spread to Kent that John Ball became involved but he quickly, according to folk-lore and the chroniclers of the period, became one of the revolt’s leaders. He was certainly one of the most eloquent representatives of the Peasants Revolt. Ball probably began his career in St Mary’s Abbey, York where he was ordained as a priest. He next appears in Colchester in 1366 when he was arrested for heretical preaching and forbidden from preaching. John Ball was not deterred. He attacked the wealth of the church and preached for equality between social classes. In 1376, he was arrested by the new archbishop of Canterbury, Simon of Sudbury because he preached that people need not pay their tithes to unworthy priests. Even more inflammatory he said that all property should be shared in common among all people. He was in prison at the outbreak of the Peasants’ Revolt in June of 1381. He wrote many letters from prison to his supporters continuing to urge them to break free from social injustice. When the revolt reached Maidstone one of the first things that Wat Tyler did was to free Ball. Ball gave a sermon at Blackheath saying “When Adam delved and Eve span, who was then the gentleman?” The peasants were so inflamed by his words that they demanded the heads of King Richard II’s bad advisors— Richard returned to the Tower with the men who the commons wanted to kill and the next day the commons rampaged through London. Ball survived the death of Wat Tyler, there is no further reference to him after the famous sermon speech at Blackheath “When Adam delved and Eve span – who then was then the gentleman?” He escaped London and went into hiding. He got as far as Coventry where he was discovered, captured and dragged back to face the king. He was hanged, drawn and quartered on July 15 1381 at St Albans after judgment by Richard II. His head ended up on a spike on London Bridge. In the city itself people began to rebuild their homes and their lives where they could. Many Flemings and Lombards had been killed during the unrest and now the King and his council ordered Englishmen to leave London if there had not lived there for a year and a day. It was said by chroniclers of the period that Ball was a supporter of Wycliff and the Lollards but it is thought that this was an attempt by the authorities to implicate them in the events of the revolt. This entry was posted in Fourteenth Century and tagged Blackheath, Coventry, execution, John Ball, London, Mad Priest of Kent, Peasants Revolt, Richard II, St Albans, Wat Tyler by JuliaH. Bookmark the permalink.